What a beautiful day it was last Saturday, perfect for a spring wedding! We delivered this three tiered wedding cake to The Lawn, Rochford where the new Mr and Mrs Rourke were married, surrounded by their closest friends and family. 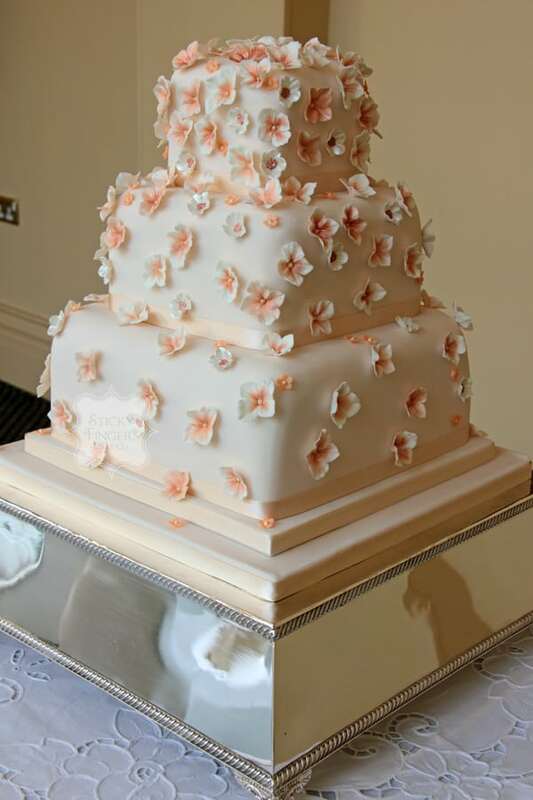 They chose to have my “Lou-Lou” cake and as the bride was wearing a gorgeous dusty peach sari, I scattered the cake with pretty peach blossoms, which matched the material perfectly. The cake flavours they chose to have were White Chocolate and Passion Fruit for the bottom tier and Red Velvet for the other two tiers – yummy! I just wanted to say a quick thank you for the cake. It looked amazing and tasted even better! I will send you along a photo for your use once we return from honeymoon.